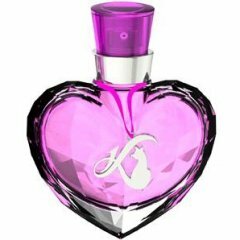 In Love is a perfume by Daniela Katzenberger for women and was released in 2013. The scent is floral-synthetic. It was last marketed by Luxess. This "creation" must be the result of an identity crisis. While Daniela Katzenberger's first fragrances were just ordinary fruity-florals, this one is a fragrance for people who want to be noticed at any price. I smell strong artificial orange blossom and jasmine. The heady musk and cedarwood concoction coupled with berries is a generic syrup pointing into the direction of the sticky and off-putting scents offered by other "celebrities" whose names start with a "K". Why did I have to buy it then? Well, my daughters and I love cats. And the younger one, whose name happens to begin with a "K", too, wanted the bottle because of the "K" for "Katze" and the "K" for her own name. Will my young Miss "K" use up the contents? I doubt it. Thumps-up for the marketing-department. They seem to know we collect perfume vessels. Write the first Review for In Love!